This powerful book examines why harmful consequences too often follow when government sets out to direct our health care systems. It contrasts government programs and private market alternatives for supplying health care services. American Health Care contrasts government and market options to supply health services, showing that the market can go further in performing critical functions in health care. This book is required reading for health policy-makers, economists, historians, and health care professionals. Medical ignorance isnt bliss, its required by law. FDA restrictions on advertising prevent firms from informing consumers of the full benefits of medicines. As a result, consumers are less healthy and pay far more. Rather than seeking price controls, seniors seeking to reduce the cost of prescription medicines should ask Congress to control the FDAwhich raises the cost of new medicines through regulations. FDA delays in the approval of life-saving medicinesnow lasting about eight yearscause tens of thousands of deaths each year. Reform medical malpractice laws to discourage frivolous lawsuits and encourage health-care providers to focus on actual treatments instead of defensive medicine. The number of unfounded lawsuits can be lessened, decreasing insurance costs, if courts and insurers learn more from doctors about the care they give. Medicare and Medicaid costs quickly exceeded projections after becoming lawsome doubling in the first year! Caps, controls, and transfers to states have failed to rein in runaway expenditures on health care. Medical savings accounts (MSAs) and private contracts. MSAs would make health coverage portable and affordable, reducing the number of people uninsured, and consumers would see even greater savings and choices through private contracts for health-care services. The privacy of Americans is threatened as health records go online. The Health Insurance Portability and Accountability Act of 1996 authorizes the broad collection of health information and the assignment of a unique health identifier for health-care consumers. Licensed to care? Removing licensure requirements for health-care providers would lessen the medical labor shortage without sacrificing the quality of service. In the United States today, one out of every seven dollars of income is spent on health care. Yet according to a variety of measures, such as life expectancy at birth or life expectancy at age 65, the American health care system performs poorly. The comprehensive new book, American Health Care: Government, Market Processes and the Public Interest, explains why our high-cost system produces inferior results, and it describes fundamental reforms to improve access to good quality, affordable health care. Unlike most efforts at reform, which would increase government control of health carean approach that was rejected by the American public in 1994 and is increasingly being abandoned in Canada, Britain and elsewhere around the worldAmerican Health Care argues for realistic, market-based policies based on deregulation, privatization, and greater reliance on competitive markets. 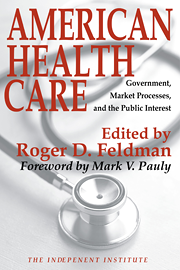 Edited by Roger Feldman, professor of health insurance at the University of Minnesota, American Health Care contains the insights of prominent economists, legal scholars and historians who explore the origins of the current health-care system and its flaws, and propose practical and highly effective ways to resolve these problems. Part two of American Health Care examines the regulation of hospitals, pharmacies, and other health-care services. Michael Morrisey, director of the Lister Hill Center for Health Policy at the University of Alabama, points out that in response to greater competition many health-care providers have turned to state governments to help them to cartelize their industries and keep prices and profits above competitive levels. Certificate-of-need (CON) laws are supposed to lower costs but, Morrisey writes, the exhaustive literature on CON yields virtually no evidence that it has controlled costs. Instead, CON laws have restricted the entry of new hospitals and, as a result, increased prices. Morriseys evaluation of CON laws is seconded by Barbara Ryan, vice president of Capital Economics, who examines CON regulations and their peculiar interaction with antitrust regulation. Richard Epstein, professor of law at the University of Chicago, then presents an examination of the unintended consequence of regulations governing community ratings and preexisting conditions. The regulation of health care personnel is the subject of part three of American Health Care. H. E. Frech, professor of economics at the University of California at Santa Barbara, finds that price controls on physician fees are so pernicious that the key principal of any reform must be the absence of price controls in any form and under any euphemism. Shirley Svorny, professor of economics at California State University, Northridge, finds licensure laws for physicians of diminished value and suggests that the states experiment with allowing increased roles for non-physician providers. Patricia Danzon, professor of health-care systems and insurance in the Wharton at the University of Pennsylvania, calls for reform of medical malpractice laws to limit non-economic damages and discourage speculative litigation. However, such reforms as shifting to a no-fault compensation system would create unnecessary injuries and should be avoided. American Health Care is an exciting, comprehensive, and very timely volume that challenges the conventional wisdom on health-care provision and offers practical de-bureaucratization proposals for reform that would produce dramatic cost reductions, better quality, and greater access for all Americans, especially the most disadvantaged. Roger D. Feldman is Professor of Health Insurance, Center for Health Services Research at the University of Minnesota and a Research Fellow at The Independent Institute.